Dr. Hang Ta holds joint appointments at Australian Institute for Bioengineering and Nanotechnology and School of Pharmacy, the University of Queensland. Expertise: Dr Hang Ta’s research addresses solutions for current problems in diagnosis and treatment of diseases. She is a pioneering bio-nanomaterials researcher developing innovative nanomaterials and magnetic resonance imaging (MRI) nanosensors for molecular imaging and drug delivery for cardiovascular disease in Australia. Dr Hang Ta’s team has great expertise in the full suite of forefront materials characterization techniques, and is skilled in the design of molecular imaging and drug delivery systems based on metal oxide and biocompatible polymers. 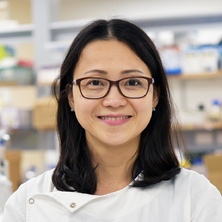 Awards and Funding: Dr Hang Ta has been awarded a number of prizes, grants and prestigious fellowships such as National Heart Foundation postdoctoral fellowship and NHMRC ECR fellowship. She has secured over $1.4 million in competitive grant funding from national funding agencies for both discovery and infrastructure projects. Research Outputs and Impacts: Dr Ta has published papers in journals with high impact factor such as Nature Protocols (Jif: 11.74), Circulation Research (Jif: 11.861), Biomaterials (Jif: 8.496) and Journal of Controlled Release (Jif: 8.078). Her research on iron oxide nanoparticles for molecular imaging of thrombosis was highlighted on cover page of Circulation Research, a second-ranked journal in the field of cardiovascular research. Teaching: Dr Hang Ta is a lecturer for CHEE4305 (Biomaterials: Materials in Medicine), the University of Queensland and also a guest lecturer for AMME5931 (Nanomaterials in Medicine) at the University of Sydney. She has been a principal supervisor of more than 15 undergraduate and postgraduate students. Links: Dr Hang Ta has links both across Australia and internationally, including Baker IDI Heart and Diabetes Institute, Monash University, University of Melbourne, University of Wollongong, Curtin University, Princess Alexandra Hospital, Prince Charles Hospital, and Soochow University (China). Every newly developed drug need to be tested through several rounds of animal testing before they can be tested on human. However, a rodent or chimp’s response to a medication does not alsway translate so smoothly in a person. This project aims to develop chips that mimics the biological processes of cardiovascular diseases, which allows testing new therapies freely on “subjects” without harming any living creatures and lessen the need for animal testing. The early detection and accurate characterization of life-threatening diseases such as cardiovascular disease and cancer are critical to the design of treatment. Knowing whether a thrombus in a blood vessel is new/fresh or old/constituted, and whether a tumour mass has hypoxia region is very important for physicians to decide a treatment protocol. This project will develop smart magnetic resonance imaging nano-sensors that can detect, sense and report the stage or progression of cardiovascular diseases such as thrombosis, the leading cause of death in Australia and worldwide. Inflammation is part of the complex biological response of body tissues to harmful stimuli, such as pathogens, damaged cells, or irritants. Chronic inflammation might lead to a host of diseases, such as hay fever, periodontitis, atherosclerosis, rheumatoid arthritis, and even cancer. For example, in atherosclerosis, inflammation plays a key role in all stages from initiation of plaque development to transition of a plaque from stable to a rupture-prone state. This project will investigate novel approaches to develop nanomaterials which combine both therapeutic and diagnostic capabilities for inflammatory diseases in one dose. Nguyen, Luong Duc, Cao, Cuong, Ta, Hang Thu, Le, Tien Thuy and Phan, Huyen Thi Enzyme Technology. Ho Chi Minh City, Vietnam: Vietnam National University Publisher, 2004. Ta, Hang Thu (2010) Light Scattering for the masses effect of heating on molecular weights of chitosan. LCGC Europe: solution for separation scientists, 27-27. Ta, Hang , Li, Zhen , Hagemeyer, Christoph , Karlheinz, Peter and Whittaker, Andrew K. (2016). Dual contrast iron oxide nanoparticle as a potential contrast agent for molecular imaging of cardiovascular disease. In: 7th International Nanomedicine Conference, UNSW Sydney, NSW Australia, (). 27-29 June 2016. Ta, Hang , Li, Zhen , Hagemeyer, Christoph , Karlheinz, Peter and Whittaker, Andrew K. (2016). Molecular Imaging of Cardiovascular Disease Using Dual Contrast Iron Oxide Nanoparticles. In: Joint Annual Scientific Meeting AAS, HBPRCA, and AVBS 2016, Grand Chancellor Hotel, Hobart Tasmania, (). 7-10 December 2016. Ta, Hang , Leitner, Ephraem , Jia, Fu , Putnam, Katherine , von Elverfeldt, Dominik , Karlheinz, Peter and Hagemeyer, Christoph (2016). Targeting Imaging Contrast Agents and Live Cells in Cardiovascular Disease via a Chemo-Biotechnological Approach. In: 17th International Biotechnology Symposium and Exhibition, Melbourne / Melbourne Convention Centre, (). 24-27 October 2016. Ta, Hang , Li, Zhen , Hagemeyer, Christoph , Cowin, Gary , Kurniawan, Nyoman , Karlheinz, Peter and Whittaker, Andrew K. (2016). Toward Better Diagnosis for Cardiovascular Disease: Molecular Imaging via Dual Contrast Iron Oxide Nanoparticles. In: QCVRN Cardiovascular Research Showcase Event, Brisbane, Australia, (). 22 November 2016. Ta, Hang , Li, Zhen , Hagemeyer, Christoph , Karlheinz, Peter and Whittaker, Andrew K. (2016). Ultra-small positive and negative dual contrast iron oxide nanoparticles for molecular imaging of cardiovascular disease. In: 84th European Atherosclerosis Society Congress, Innsbruck, Austria, (). May 29 - June 1 2016. Ta, H., Prabhu, S., Leitner, E., Jia, F., Putnam, K., Bassler, N., Peter, K. and Hagemeyer, C. (2015). Targeted Molecular Imaging and Cell Homing in Cardiovascular Disease Via Antibody-Sortagging. In: 83rd Congress of the European-Atherosclerosis-Society (EAS), Glasgow Scotland, (E26-E26). Mar 22-25, 2015. Ta, Hang T., Leitner, Ephraem, Jia, Fu, Nair, Ashish, Karlheinz, Peter and Hagemeyer, Christoph E. (2014). A Universal Approach to Targeted Cell Delivery in Cardiovascular Disease. In: NanoBio Auatralia 2014, Brisbane, Queensland, Australia, (). 6 - 10 July 2014. Ta, Hang, T., Li, Zhen, Leitner, Ephraem, Jia, Fu, Peter, Karlheinz, Hagemeyer, Christoph E. and Whittaker, Andrew (2014). The development of targeted multimodal iron oxide particles for imaging of cardiovascular disease: A marriage between chemistry and biology. In: 7th Asian Biological Inorganic Chemistry Conference, Gold Coast, QLD Australia, (). 30 November - 5 December 2014. Ta, Hang T., Leitner, Ephraem, Jia, Fu, Peter, Karlheinz and Hagemeyer, Christoph (2012). Functionalization of MR and CT agents for atherothrombosis imaging. In: Australian Vascular Biology Society 20th Annual Scientific Meeting, Gold Coast, Australia, (). 13-16 September 2012. Ta, Hang T., Prabhu, Sandeep, Leitner, Ephraem, Jia, Fu, Putnam, Katherine, Bassler, Nicole, Peter, Karlheinz and Hagemeyer, Christoph (2011). A novel chemo-enzymatic approach for targeted delivery of contrast imaging agents and stem cells in cardiovascular disease. In: National Heart Foundation Conference 2011, Melbourne, Australia, (). 17-19 March 2011. Ta, Hang T., Leitner, Ephraem, Jia, Fu, Peter, Karlheinz and Hagemeyer, Christoph (2011). Synthesis and functionalization of contrast particles for molecular imaging of atherosclerosis. In: 6th European Molecular Imaging Meeting 2011 (EMIM 2011), Leiden, Netherland, (). 19-21 June 2011. Hang, T. Ta, Prabhu, Sandeep, Leitner, Ephraem, Jia, Fu, Putnam, Katherine, Bassler, Nicole, Peter, Karlheinz and Hagemeyer, Christoph (2010). Particle and cell targeting to atherothrombosis via Sortase A coupling. In: Australian Vascular Biology Society (AVBS) Annual Scientific Meeting 2010, Lorne, VIC, Australia, (). 16-19 September 2010. Dass, Crispin, Ta, Hang T., Tan, Mei L., Khachigian, Levon M., Larson, Ian, Dunstan, David E. and Choong, Peter F. (2009). Chitosan-based systems for cancer chemo-gene-therapy. In: 21st Lorne Cancer Conference, Lorne, VIC, Australia, (). 12-14 February 2009. Ta, Hang T., Dass, Crispin, Larson, Ian, Choong, Peter and Dunstan, Dave (2008). A drug delivery hydrogen system for osteosarcoma chemo-gene therapy. In: The Melbourne Engineering Research Institute (MERIT) Symposium 2008, Melbourne, Australia, (). 2 October 2008. Ta, Hang T., Dass, Crispin and Dunstan, Dave (2007). Thermosensitive and pH-dependant chitosan/orthophosphate hydrogel delivery system. In: NanoDDS'07: Fifth International Nanomedicine and Drug Delivery Symposium, Boston, MA, USA, (). 2-3 November, 2007. Ta, Thu-Hang and Dunstan, David (2006). Thermally chitosan/orthophosphate gelling system. In: 25th Australian Colloid and Surface Science Student Conference: Program and Abstracts. 25ACSSSC: 25th Australian Colloid and Surface Science Student Conference, Beechworth, VIC, Australia, (86-86). 6-10 February, 2006. Ta, Hang T., Nguyen, Nga T., Nguyen, Luong D. and Phan, Huyen T. (2002). Applications of papain in food industry and medical field. In: 8th National Science and Technology Conference, Ho Chi Minh City, Vietnam, (). 26-29 April, 2002. Currently, there is a lack of effective therapeutics for internal bleeding following a traumatic event. In this project, novel reversible blood clotting nanomaterials will be designed to be able to hunt for internal injuries and bleeding and then stop the bleeding quickly.